I’ve had a good reminder recently why Primary Series is called Yoga Chikitsa. Pattabhi Jois used it as such, individualizing the practice as a tool for helping people through their ailments. As ashtanga becomes more and more popular and as the shala in Mysore, India fills with more and more people, the teaching can’t be the same as when Pattabhi Jois was working with12 students at a time in his Lakshmipuram home. Sometimes, we get the impression that even Ashtanga is becoming more and more a cookie-cutter practice–and perhaps this is true with led classes emphasizing pace and count and with just a few emphasized adjustments to work with the large numbers shuffling in and out of the KPJAYI shala. But look carefully at the mysore space and you’ll see the spirit of self practice is still alive, still strikingly independent, still very personal. Peek into the afternoon classes with just a handful of people. Or observe the individuals working through specific issues. But during my visit to Barcelona, this spirit, I recognize, comes to life in the more intimate satellite spaces around the world where the practice is taught–where teachers have time and space to get to know their students, to take into consideration their personalities and lifestyles, injuries, physical, mental and emotional states. It’s exciting to see. It’s inspiring. And, for a teacher, incredibly instructional. 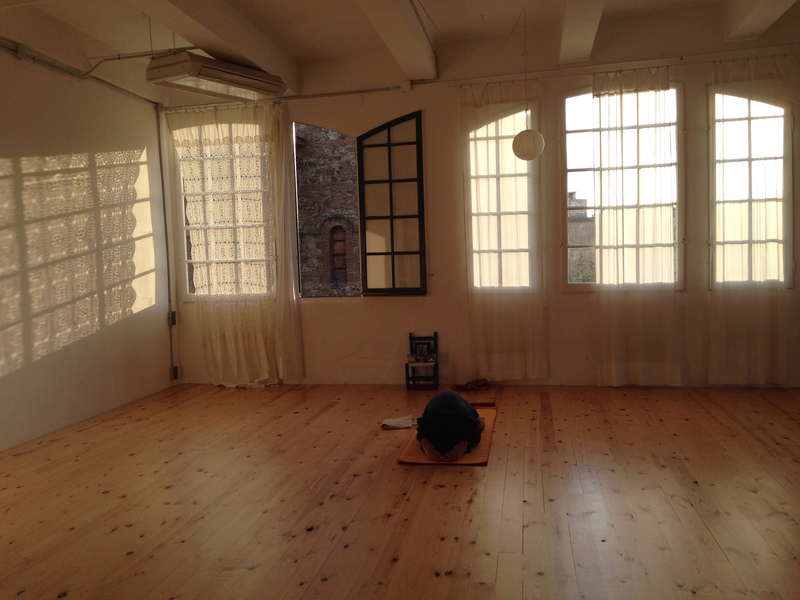 Photo: Pazzifica Ashtanga Yoga (Gracia, Barcelona), a space where the tenets of yoga therapy are in practice. Honored and excited to sub for Paz in January. This entry was posted in Classes & Offerings and tagged Ashtanga, Mysore, One Love Yoga, Practice Practice All is Coming, Primary Series, Yoga, Yoga Chikitsa by sisterhoodofthetravelingmala. Bookmark the permalink.